Along Centennial Trail near Gonzaga University. On Sunset coming into town, a motel wouldn't take VISA with out a driver's licence. Non driver's ID isn't enough. Discrimination against non drivers, so I headed on downtown. Found a more friendly place. The trip is going well for the most part. Enjoyed my visit to Grand Coulee Dam. Also had a good ride over North Cascades Pass. Have camped most nights, but stayed in a few motels. 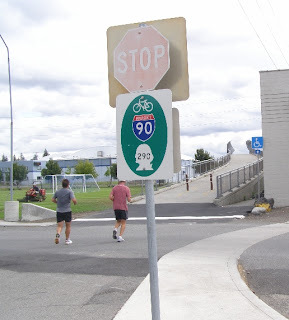 Spokane does have a great bike path that goes from downtown all the way into Idaho. Over 50 miles of velvet like pavement just for bikes. Plan to ride on part of it tomorrow, but have ridden the entire distance in 2005. It's raining and the forests need it, but my socks are wet. I can change to dry socks easier than a burned forest can be replanted. More news farther down the road. Headed to Pullman next. I thought this was interesting in your blog. What do non-drivers do when faced with this situation?